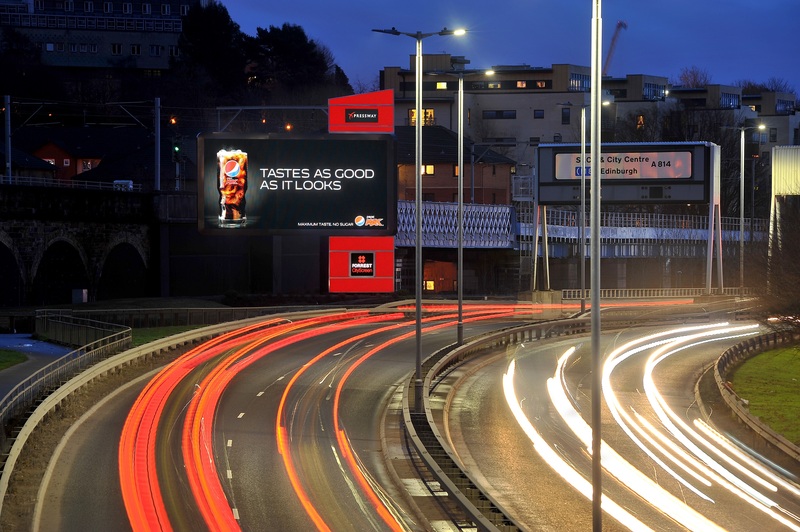 Forrest Media has launched its newest digital superstructure in the heart of Glasgow – the ‘Xpressway’ is a spectacular ‘V’ angled double sided digital Daktronics 10mm Blue Series display, overlooking the main arterial Clydeside Expressway. It should deliver huge numbers of vehicles to and from Glasgow and connecting on to the M8 for Edinburgh and the West, the Clyde Tunnel and the M74 South, as well as to the centre of Glasgow itself. Each face displays an impressive 50 square metres of high resolution image, mounted onto what has become an instantly recognisable LED Forrest ellipse. The site will operate as a 1 in 4 (one minute loop) and early adopters we are told, include: Facebook, Pepsi, Las Vegas Tourism and Land Rover. This entry was posted on Tuesday, January 31st, 2017 at 19:03 @836 and is filed under DailyDOOH Update. You can follow any responses to this entry through the RSS 2.0 feed. You can leave a response, or trackback from your own site.